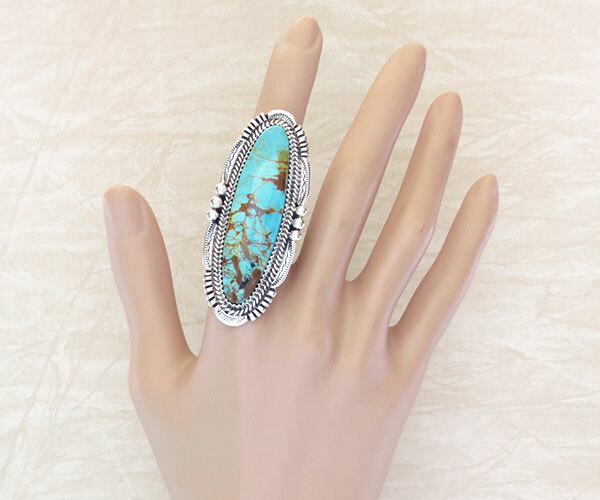 This stunning handcrafted ring was made by Navajo artist & silversmith Will Denetdale. 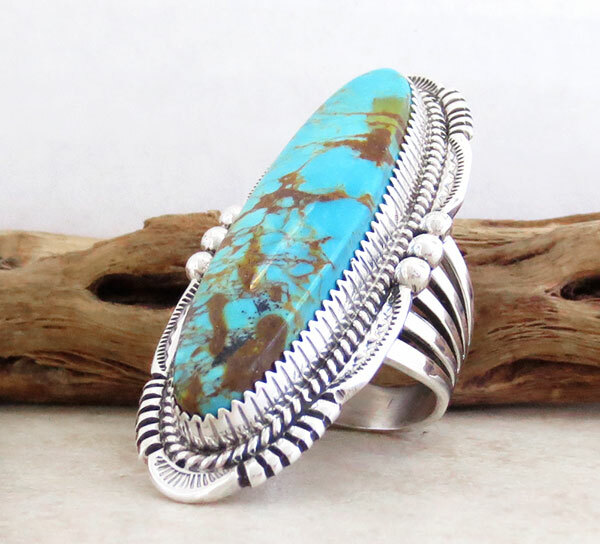 The Kingman turquoise stone is a bright sky blue with a light to dark gold matrix. silver wire. There's fine stamp work as well as applied sterling silver beads around the border. It has a wide split shank band. It's marked sterling and signed W Denetdale Navajo. 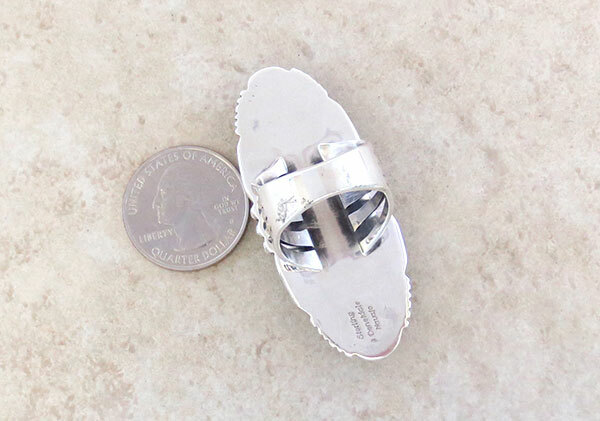 It's 2 1/4" tall tall by 7/8" at it's widest point. The stone is 1 7/8" tall by 1/2" wide. Total weight: 9.4 grams on my scale. "A quiet man, Will Denetdale rises each morning to the sun and his work. It is a life he has chosen for himself. Every day he thinks about his art; every night he dreams about his work, the creation process stirring within him. 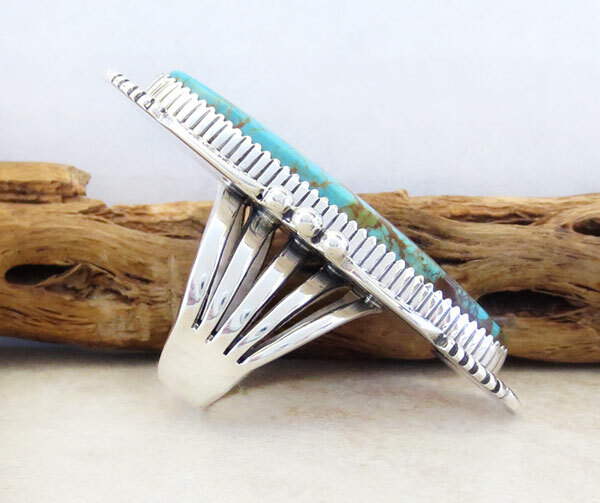 Born at Fort Defiance, Arizona, Will attended high school in Gallup, New Mexico, where he took silversmithing classes. 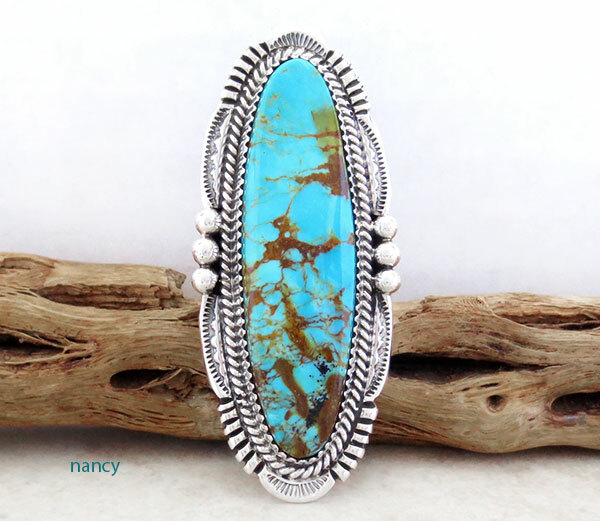 After graduating he stayed in Gallup for a while, working in the production of silver and turquoise jewelry. His name is becoming famous in his trade; his art a standard by which other pieces may be judged. Will lives in Southern Arizona where he works in his home. Will hopes his work of pride will become someone's pride and joy: well worn and well loved."